The Gauer Flo-Rak carton flow shelf & track system eliminates the need for extra hardware to hold the track and guide in place. This system allows for simple adjustments to accommodate product and package size changes unlike many full width roller runway options, which we only provide as a special order. Additionally, track horizontal adjustability can be made as small as ½ inch or ⅝ inch increments, depending on the shelf style. This makes it possible to achieve maximum product density. Ease of operation and implementation, combined with Gauer’s roller design ensures smooth flow while preventing product hang-ups. 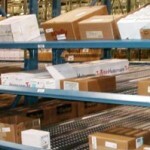 The Gauer Flo-Rak carton flow shelf system is quite simply the best designed shelving system in the business. 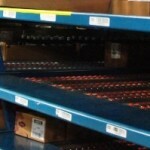 Gauer shelf frames eliminate the need for extra hardware to hold the roller track and lane dividers in place. The “click-in” track attachment method now creates a remarkably strong lock between Gauer’s Flo-Trak product and these Flo-Rak Shelf Frames. 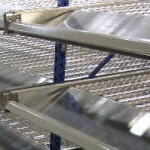 These modern carton flow shelf styles are undoubtedly the strongest in the business, but they can also produce an extreme amount of rollers per box scenarios due to the superbly engineered shelf frames. This system allows for simple adjustments to accommodate product and package size changes unlike many full width roller runway options, which Gauer only provides as a special order. Additionally, track horizontal adjustability can be made as small as ½ inch or ⅝ inch increments, depending on the shelf style. This makes it possible to achieve maximum product density. Ease of operation and implementation, combined with Gauer’s roller design ensures smooth flow while preventing product hang-ups. 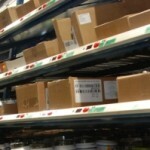 Flo-Rak shelving can be mounted into Gauer’s standalone vertical frames or can be attached to the uprights in a pallet rack system, Gauer’s shelf frames can be made to fit any style of pallet rack. 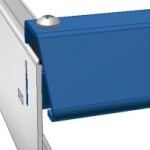 This post mounting eliminates the need for beams on each level of the carton flow system, thus increasing vertical density, possibly translating into additional levels, and allowing for better adjustability. 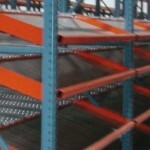 The only beams that you would require, with the Flo-Rak shelving options is to provide structural support to the rack itself. This is why the Gauer Flo-Rak shelving system gives you the best “bang for the buck” when it comes to designing a new carton flow rack system.